Hocker’s Mill Accounts | slate river ramblings . . . .
Buckingham history is scattered everywhere! An account between William Hill Winfrey and George Hocker of Hocker’s mill has survived and is contained in the Allen Papers, housed at the Virginia Historical Society. Dated 1840-1843, it shows that “Winfree” purchased bran, flour, wool, and wood at Hocker’s Mill. 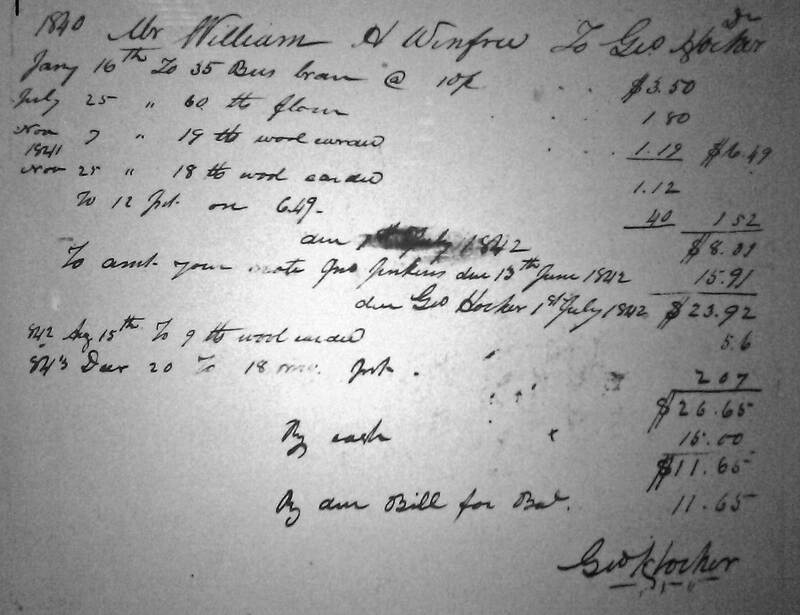 Hocker also backed Winfree’s note to John Jenkins, due June 13, 1842, for $15.91. Very nice to see this. My understanding is that one of William Hill Winfrey’s son’s (John Allen) moved to Fayette County TN and built a home built in 1830. It was called Chestnut Hill and today Winfreys still live in and gather there often. It’s nice to see this piece of connection back to our Va Winfrey’s. btw… I’m assuming that George Hocker wrote this piece… and thus the reason for the name spelled a bit differently (ee at the end instead of ey). We bought a house from a George Hocker in Baltimore in the mid 1980s. They had had the house for nearly 50 years. Wonder if it could have been part of this family?